Cuisinecuisine.com is a wonderful website where you can find lot of information regarding Indian culture and tradition. You can also find many delicious Indian recipes in the site. The website also provides information on restaurants, temples, etc in USA. In simple, the website is a boon to us. I entered their contest few months back and even forgot about it. A couple of weeks before, I received their email saying that I won their summer contest. Naturally, I was surprised and excited to know about my win. 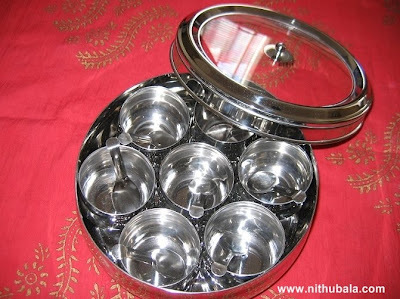 I received a beautiful looking, very useful traditional Indian Spice Box (Masala dabba) or Anjarai petti in Tamil from them this weekend. They run the contest for every season and now, they are doing it for Fall. Visit their site for more details regarding their event. Also, don't forget to check on their delicious recipes. Giveaway @ Kiran's blog - CSN $50 giveaway. CSN $35 giveaway in this blog. 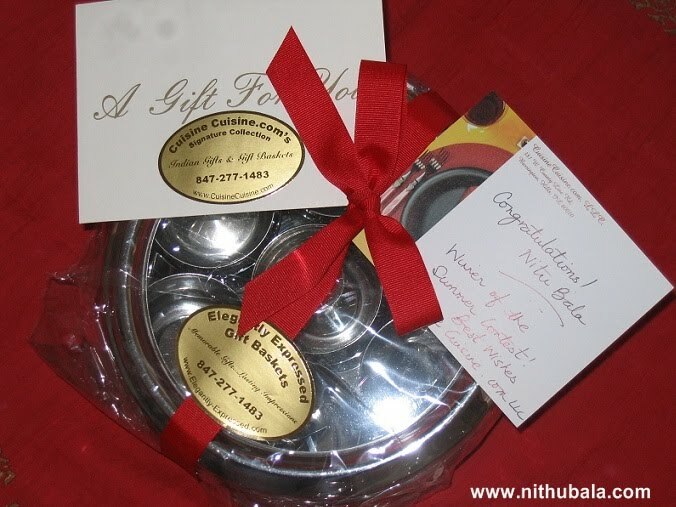 I have known Cuisine cuisine from a very long time.....Thats a really wonderful win Nithu!!...congrats!! Congrats and love that box too! Congrats Nithu Nice Anjarai petti with glass lid. Congrats Nithu..Loved the Anjari petti !! Hi Nithu congrats on winning the contest and winning the anjana petti.Just keep rocking,all the best wishes. Congratulations Nithu !! so happy for you ! !